This cake was fun and different to make. 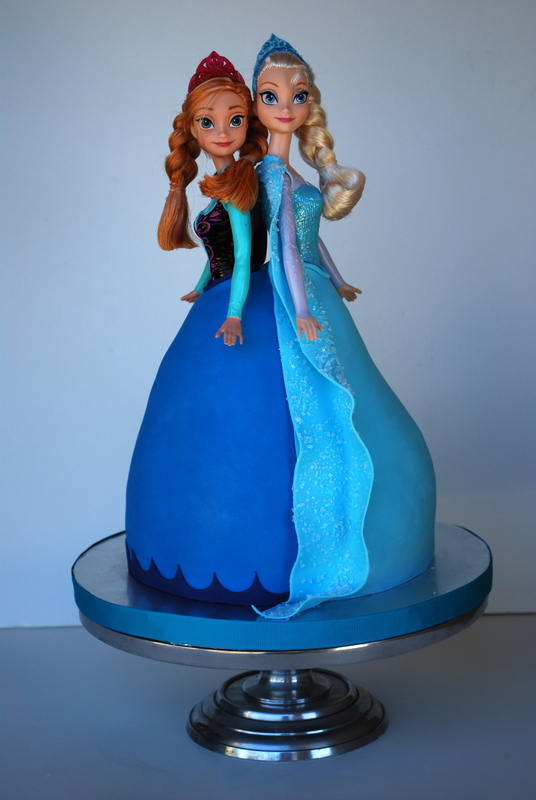 The dolls were carved in 8 alternating layers of white and blue cakes with buttercream filling. Their dresses were very shiny with lots and lots of luster dust! Too bad the picture doesn’t show well the shimmer! 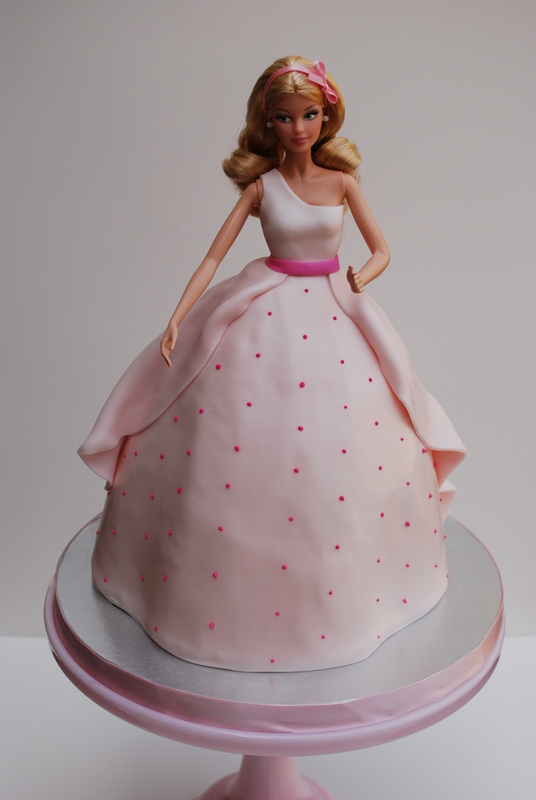 I never made a doll Cake with 2 dolls before sharing the same dress. So it was a experiment that worked really well I would say! The priceless jaw dropping of the 2 year old birthday girl not understanding if was a gift, a toy or a cake when I was delivering it made my day! I would say it is all of those above with lots of love and dedication put into it! 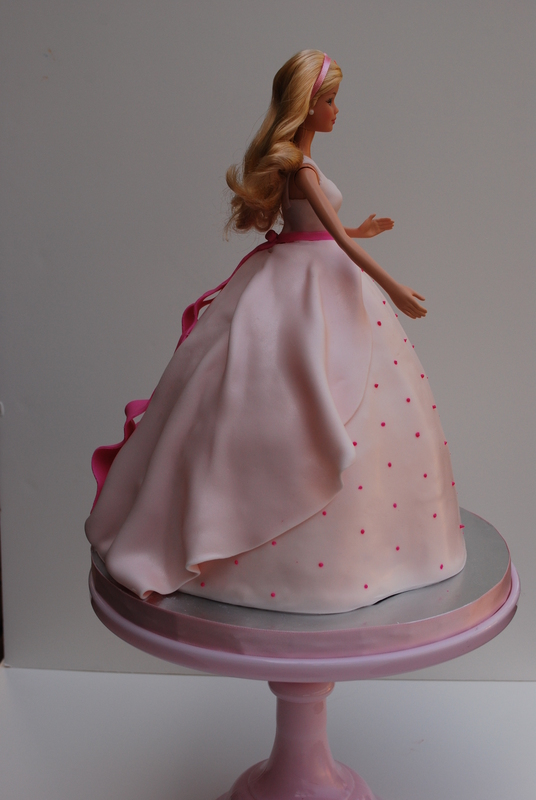 I love to make doll cakes and I hope I can keep having them as orders! This was an order for aspecial friend that her daughter just turned 4! It is my third year making cakes for this princess that I am so blessed to be picked again. They wanted 2 separated cakes that matched. The doll cake for the kids and the tiered for the adults. The flavors were coconut cake with passion fruit filling and the always favorite of kids and adults chocolate, of course! 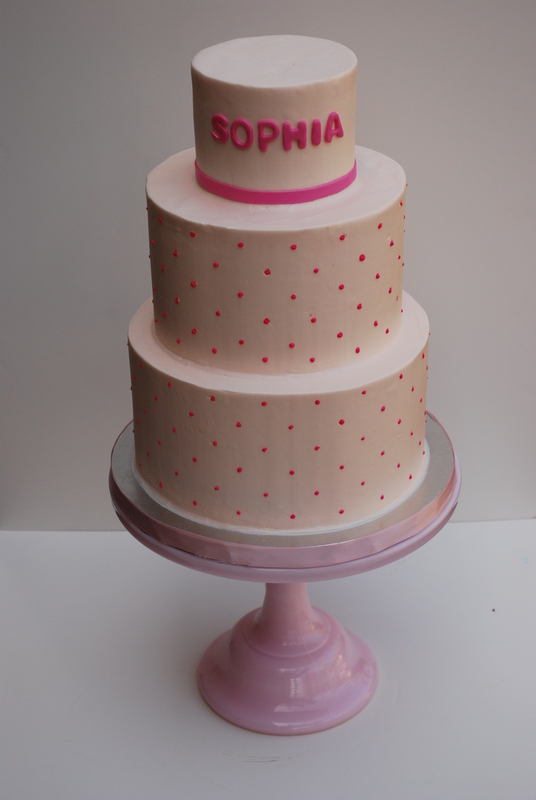 The doll cake is finished with light pink colored fondant and the tiered cake with Swiss buttercream. As always I used as many organic ingredients that I could find. For me this is very important since we want the best for our kids. This doll was a collector’s edition and simply gorgeous. Looked just like the birthday girl. I picture Sophia looking like this when she grows up. Sweet little princess she is!!! Thanks for trusting me on this very special day! Back of the cake showing the details and movement that the mother was looking for. Side view. This profile picture shows the details and the design I came up for the fluidity of the dress. Another doll cake that I loved so much to make. The little girls love the look and they are an instant decoration for the birthday table. 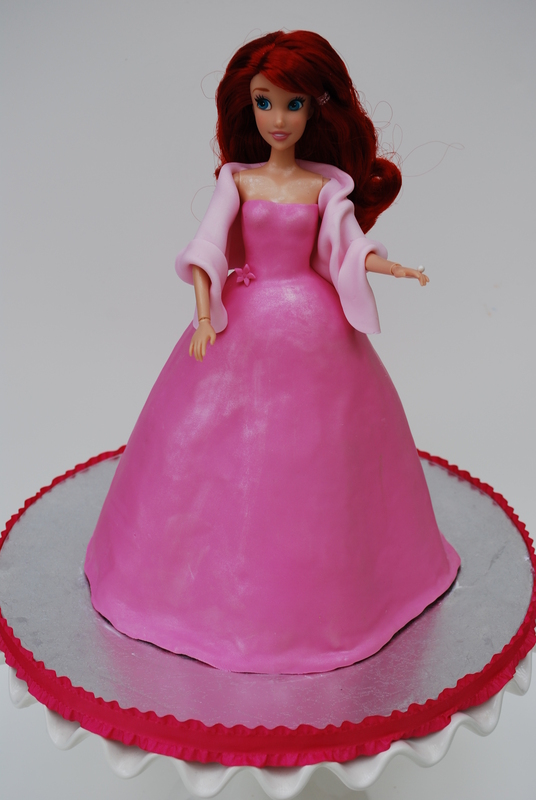 I made this one the same way I always try to make my Barbie cakes. 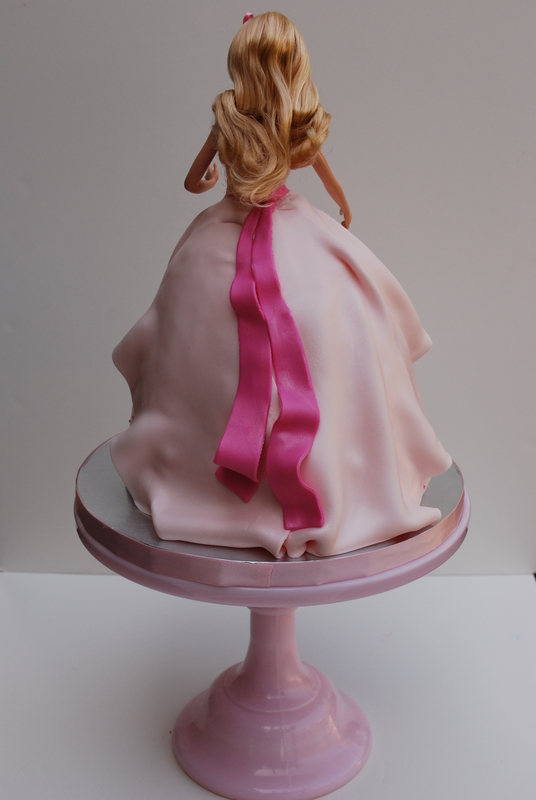 I carve the skirt of the dress to give it a special flow and then dress it up with colored fondant. To make even fancier I made a one piece dress. Since it is cool here lately, I gave her a shawl to fancy it up a little bit. She was luster dusted to give a special shine to her dress. 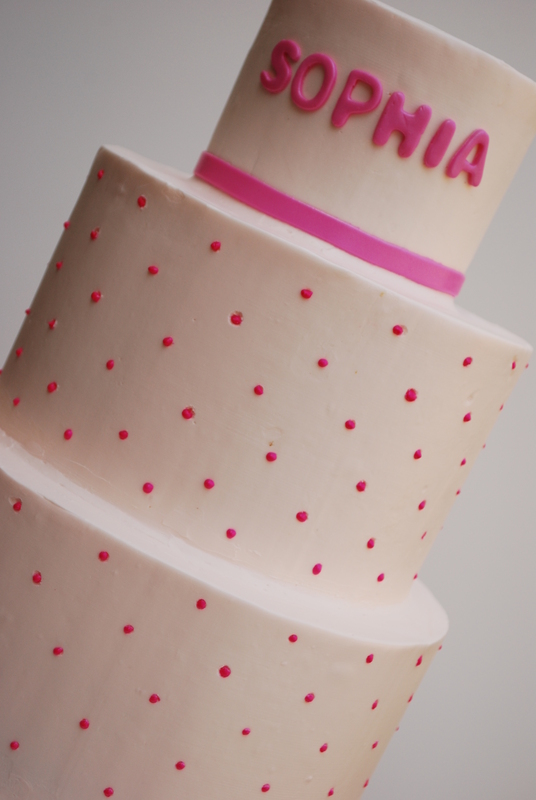 I hope this cake brightens up your day as much it did for the birthday princess!! !